Two days before Management Assistant Scott T. planned to evacuate his Fort Myers, Florida, home ahead of Hurricane Irma, he got a call that changed his plans. His National Guard unit had been called to duty. Within hours, Scott shifted roles from running the Exotic Car Collection branch in downtown Naples to that of a National Guard officer working a state of emergency. Shortly after arriving in Tampa, Scott received orders to be the National Guard brigade representative at Collier County’s Emergency Operations Center (EOC). “There certainly were tense moments during the storm, but all in all, we didn’t have any major catastrophes,” Scott adds. In the midst of Scott’s service, his wife, Sydney, discovered the home they purchased in Fort Myers just two months prior to Irma was filling with water and downed trees were wreaking havoc across their property. It’s been a whirlwind few months for the couple. Scott returned home in April from a 14-month deployment in Djibouti, Africa where he provided local security. Just two weeks before he deployed, he and Sydney got married. Scott cites the company’s support of the military as one of the factors that drew him to the Management Training program in 2014. And he sees overlap between his two roles, especially during his Irma deployment. 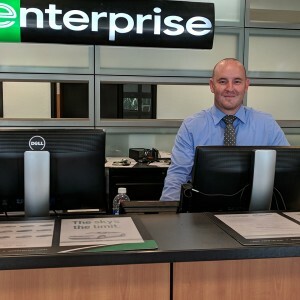 Military veterans, guardsmen and reservists comprise 10 percent of Enterprise’s U.S. workforce. Additionally, in the wake of several recent natural disasters — including Hurricanes Harvey, Irma and Maria — Enterprise Holdings supports local, state and federal government agencies with disaster relief and recovery efforts.